SEATTLE – When King County, Washington, launched its employee wellness program seven years ago, its motive was clear. “We were being eaten alive by runaway medical costs,” says the county’s top executive Dow Constantine. By all accounts, the previous administration was desperate to bring down double-digit health care cost growth that threatened to destroy the entire budget. 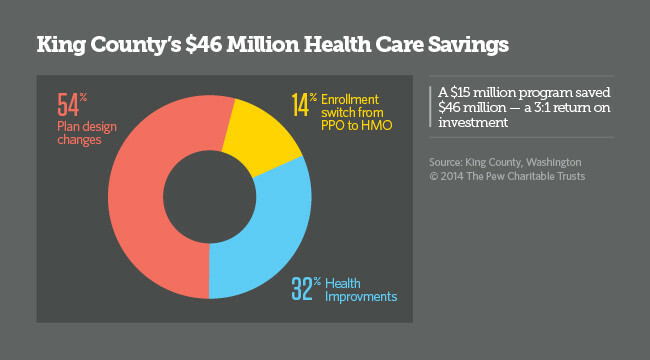 That partially explains why King County, which spends nearly $200 million per year to insure 14,000 workers and their families, who mostly live and work here in the county seat, was willing to risk millions more on a wellness program that would prove to break the traditional mold. It may also explain why labor unions took the unusual step of joining management in a plan that would ultimately shift more health care costs to workers. But it doesn’t explain why this employee wellness program, which received an innovation award this year from Harvard University, has far surpassed all others in employee participation, health improvement and health care savings. The program’s unusually high financial incentives for participation and an extensive outreach program to promote it are credited in large part for the program’s success. In its first five years (2007 to 2011), the county’s “Healthy Incentives” program invested $15 million and saved $46 million in health care spending with sustained participation by more than 90 percent of its employees. Two years ago, $61 million in surplus health care funds were returned to county coffers because cost growth was lower than actuaries had projected. Seattle, the state’s largest city, is the county seat. Employee health improved dramatically, raising King County employees’ health status above the national average and keeping it there. Smoking rates dropped from 12 percent of employees to less than 5 percent, and more than 2,000 employees classified as overweight or obese at the start of the program lost at least 5 percent of their weight, more than halving their risk of diabetes. With an average age of 48.5 years and practically no turnover, the county’s worker population is getting healthier even as it’s growing older. These results, documented in a 2012 internal report by former staff economist John Scoggins, are remarkable when compared to the generally lackluster performance of other wellness programs run by large U.S. organizations, including state and local governments. According to a 2013 report from the Rand Corporation, about half of all U.S. large employers offer some type of wellness program and the number is growing. But few end up saving any money and employee participation has been limited. Many fizzle out after a year or two. On average, only 47 percent of employees participate nationwide, and only 2 percent of organizations that offer the plans report any reduction in health care costs, according to the study, which was funded by the U.S. Departments of Labor and Health and Human Services. Overall savings from wellness plans offered by the organizations Rand surveyed were too small to be statistically valid. Still, evidence shows that workplace health programs have the potential to promote habit-forming healthy behavior, improve employees’ health knowledge and help workers get necessary screenings, immunizations and follow-up care. The Affordable Care Act encourages employers to expand wellness programs by loosening federal regulations that limit the financial rewards employers can offer workers for reaching certain health goals such as quitting tobacco use. King County’s intensive education and outreach effort cost the county nearly $7 million in the first two years. Since then, the effort has tapered, but six full-time employees still work to maintain the county’s high participation rate. “We want to make sure that no one is left out because of lack of knowledge,” said Brooke Bascom, who runs the program. The biggest draw, Bascom said, has been the financial incentives King County offers its employees for participating. Other wellness programs offer much less substantial rewards, according to the Rand report. Among the 10 percent of employees who don’t participate in Healthy Incentives, most say it’s because they don’t want to share private information about themselves. A small number are given exceptions because of health conditions or family issues that prevent them from participating. Healthy Incentives offers a model that state and local governments should replicate, said Stephen Goldsmith, director of the innovations award program at Harvard’s Kennedy School of Government. Washington state is already emulating parts of King County’s wellness plan and Oregon is trying to start a similar program. In the past, county employees didn’t pay a share of insurance premiums, but they did pay deductibles, co-insurance and co-pays. Healthy Incentives allowed workers to shave $200 off of their $500 deductible simply by filling out a health assessment form. They could get another $200 knocked off if they completed an “individual action plan,” such as attending six Weight Watchers meetings at work, completing five phone sessions with a tobacco cessation coach or learning how to better manage diabetes. Four years into the program, nonparticipants’ deductibles went up to $800. In addition, employees who did not participate in the program had to pay a 10 percent higher co-insurance share of the cost of medical care after their deductibles were exhausted. When you put those two incentives together, the individual savings could come to more than $1,000 per year. The program also encourages the use of less expensive generic drugs by increasing the co-pay for name-brand drugs from $15 to $30, while decreasing the co-pay for generic drugs from $10 to $7. These changes, put in place in 2010, resulted in $2.4 million savings to the county and a $1 million savings to employees by 2011. The wellness program began when former County Executive Ron Sims, credited with the big idea, donated $1.3 million in county dollars to help a fledgling health care organization, the Puget Sound Health Alliance, develop a medical claims database to help identify doctors and hospitals in the county that offered the highest quality services at the lowest prices. He also recruited large local employers including Alaska Airlines, Boeing and Starbucks to contribute money to the effort. By analyzing claims data, the group found that one provider organization, Group Health Cooperative, was costing the county an average of $4,000 less per person per year while providing higher quality services than all other providers in the area. Group Health already served 20 percent of the county’s employees through its Seattle-based accountable care organization. To encourage more employees to use Group Health, the county eliminated the deductible and added a graduated co-payment of $20 to $50 based on employees’ Healthy Incentives participation levels. Regence BlueShield patients remained subject to existing deductibles of up to $800. As a result, an additional 2,274 employees switched to Group Health, bringing its share of coverage to 30 percent. Between 2010 and 2011, the shift to Group Health reduced county expenditures by $6.5 million and saved employees $2.2 million. “They needed a third party to do the research,” said Mary McWilliams who now runs the Alliance. “The unions would never have trusted the research if it had come from the county or the providers,” she said. The alliance since expanded to include the state of Washington. Now called the Washington Health Alliance, the group plans to determine the highest-value services by physician groups and hospitals within the Regence network. Once those providers are identified, employees will once again be steered in their direction through reduced out-of-pocket expenses. Not everyone loved the program in the beginning. In its first two years, county employees objected to the time spent filling out forms and documenting their action plans. Some lodged formal complaints. Kathy Pompeo was one of them. Bascom said the county took complaints to heart and made the process easier. With such a diverse workforce — from bus drivers, road workers and custodians to law enforcement officers, doctors, attorneys and administrative workers — the county had to make accommodations so that everyone could participate. Bus drivers, for example, didn’t have access to computers, so the county developed a paper process. Even the county executive complained that the process was cumbersome. “You’d get up in the morning and exercise and then have to sit down and log on to a computer. It didn’t make sense,” Constantine said. Now employees can text their activity to the program: “I’m walking my dog,” for example. And the county applies points toward their full participation status. Has the county made it too easy to comply? Bascom doesn’t think so. Research shows that healthy habits can be formed in just four weeks. As for employees gaming the system by not really performing the activities they say they are, Bascom and others said they doubted much, if any, of that was going on. “We’re a pretty ethical group,” Pompeo said, and there’s peer pressure to do the right thing. “It’s like having a running buddy or a diet buddy, only lots of them,” she said. <a href="http://www.google.com/about/careers/lifeatgoogle/" target="_blank">Working for the search engine at the googleplex sounds pretty damn good.</a> Google employees can keep fit by using the on-sight gym or swimming pools. The narrow pools with electric water pumps provide a strong current that flows in one direction, allowing employees to swim against the current. Employees can also take advantage of the on-site hair salon and on-sight laundry room. And if that wasn't enough, they also get all their food for free! Another famous benefit of working at Google is the 20 percent time program. Google allows its employees to use up to 20 percent of their work week at Google to pursue special projects unrelated to their usual workload.